Heute möchte ich das erste Ergebnis meines neuen Projektes posten. 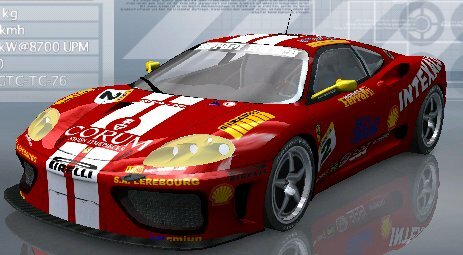 Der Ferrari F360 wurde meines Erachtens von 1999 bis 2006 für die Ferrari Challenge eingesetzt. Diese Fahrzeuge sind die Vorlage für mein Projekt. Es gab, glaube ich, 3 Challenges: 1. die italienische Challenge, 2. die europäische Challenge und 3. die nordamerikanische Challenge. Meine Fahrzeuge sind aus allen Challenges und aus allen Jahrgängen, natürlich für mich nur die schönsten Fahrzeuge, soweit ich entsprechendes Fotomaterial bekommen konnte. Schwierig wird es teilweise mit den Logos, da teilweise ziemliche unbekannte, lokale Sponsoren verwendet wurden. Aus diesem Grunde habe ich teilweise diese Logos selbstgemacht. Deshalb bitte ich um Nachsicht, wenn nicht alles 100% real ist. Dann hatte ich ja auch das Problem, mit dem Template, das mit einem Riß versetzt ist und ich Logos teilweise halbiert versetzen mußte. Also sind auch hier einige Kompromisse von mir vorgenommen worden. 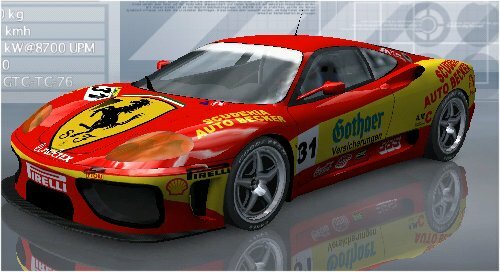 Und der Ferrari selbst ist vom Aufbau her der 360 NGT, also sind nicht die richtigen Stoßfänger montiert. Ich hoffe, Ihr mögt trotz der Kompromisse mein Projekt. Ihr könnt ja demnächst selbst urteilen, wenn ich ein Fahrzeug poste. Today I want to post the first result of my new project. 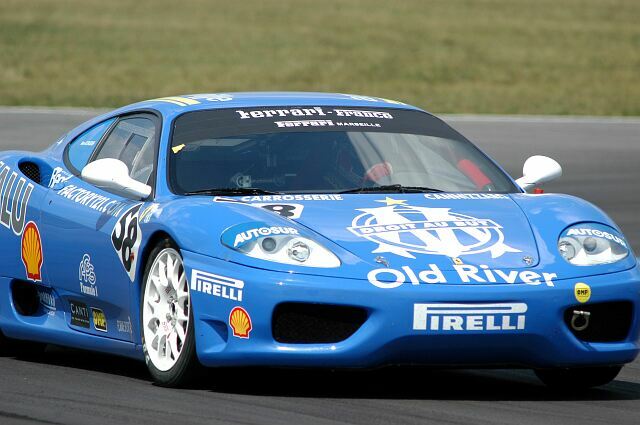 The Ferrari F360 was used I believe from 1999 to 2006 for the Ferrari Challenge. These vehicles are the template for my project. There was, I believe, 3 challenges: 1 the Italian Challenge, 2nd European Challenge and 3 the North American Challenge. My vehicles are from all challenges and from all years, certainly for me, only the most beautiful cars, as far as I could get appropriate photographs. 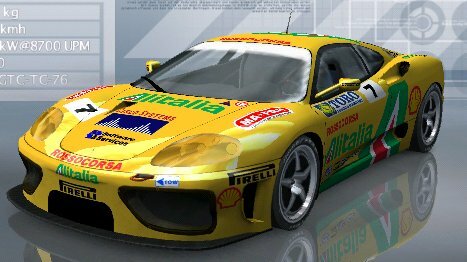 Difficult it is partly with the logos, as were some quite unknown, local sponsors used. For this reason, I sometimes even made this logo. I therefore ask your indulgence if not everything is 100% real. 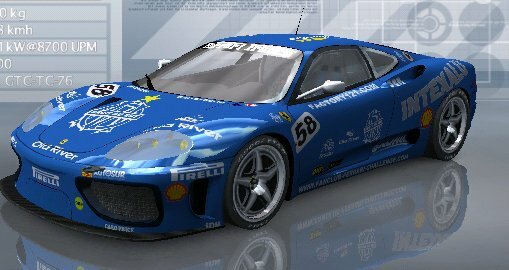 Then I had the problem with the template, which is mixed with a crack and I had to put some logos halved. So here are some compromises made by me. 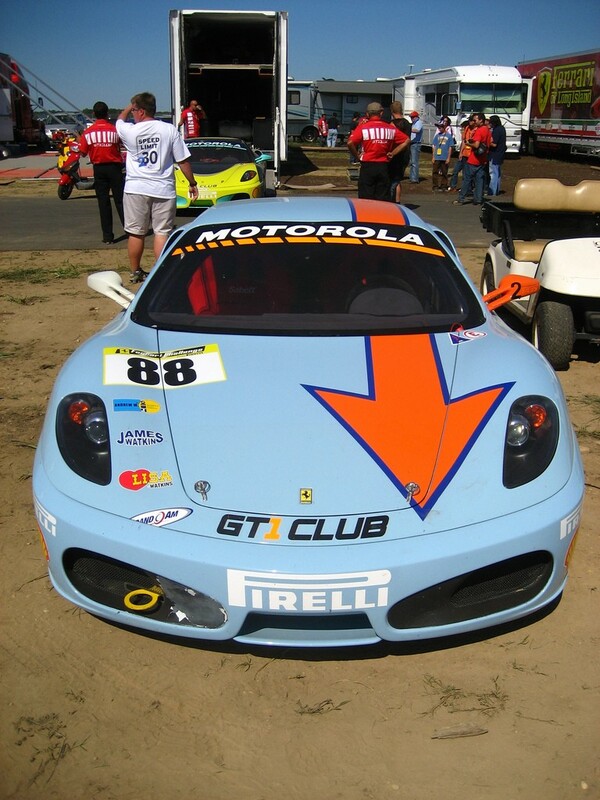 And the Ferrari itself from the structure of the 360 NGT, not the right bumpers are mounted. I hope you like my project, despite the compromises. You can judge so soon even if I post a car. Very nice, I think!! Just waiting your upload to immediately dwl, and... right foot down till the end, my hands in the wheel and accelerate in my beloved tracks at the sunrise!!!!! Cheers! thank Ney, but you must still wait a bit until you race with the Ferrari for the Sugar Loaf can. Soweit ich weiß, gibt es keinen anderen F360. Es gibt einen Mod mit Heckflügel und den Straßen-Mod von Pumkin888 ohne Flügel. Thanks again to Pumkin888 for his permission to make this challenge. 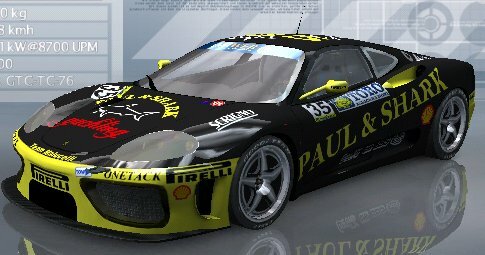 Here's a Ferrari "Paul & Shark" from the team Malucelli. Die sehen gut aus, die beiden. Hier meine Umsetzung aus der amerikanischen Challenge. Again to illustrate, the top one is from the Italian team "Ineco. This is from the bankrupt car dealer Autohaus Becker, a German team that no longer exists from the previous reasons. 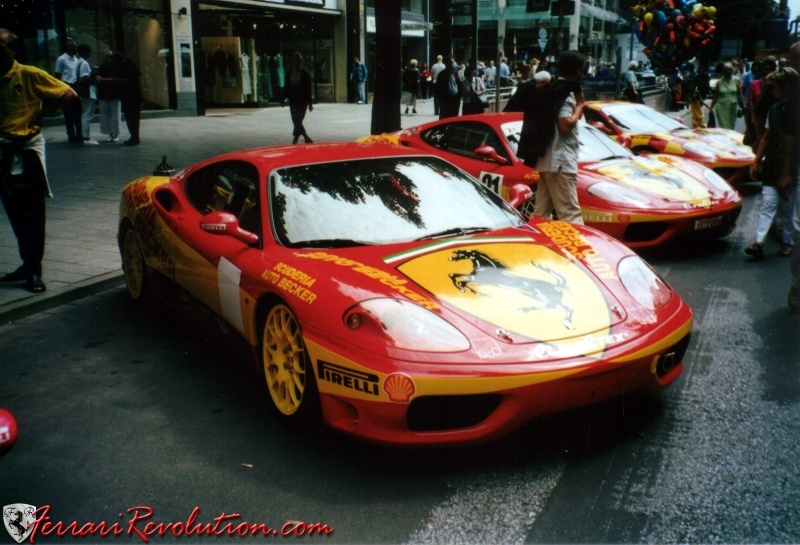 But I think the Ferrari looks cool. 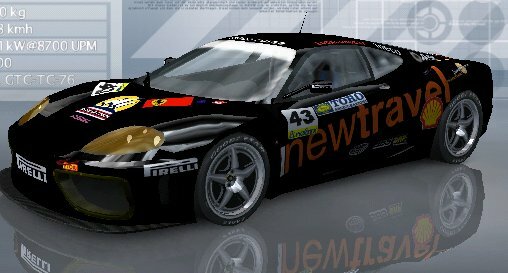 Please pay attention not so much on windows, sun visors and tires and wheels, as I have some more work on it. Der Mod wird sicher cool! Hier noch ein Foto vom Original. 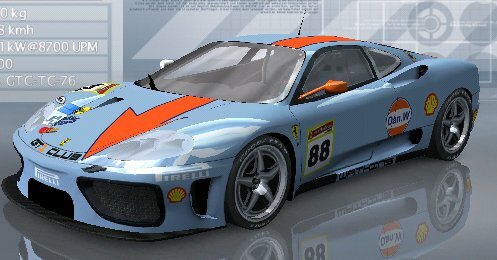 Most of my original skins are the Ferrari F360, but as I of the new F430 Challenge with some skins so amazing was that I could not resist to use them. I like this italian arrow !!! Hi Ring-Fan, can you give me the updates for the Challenge provide. If yes, is still the question of whether I use the, as I already have several vehicles ready, the new Painter again, I had no desire since so much work already is tight. But try to look at and I would like it to me already. 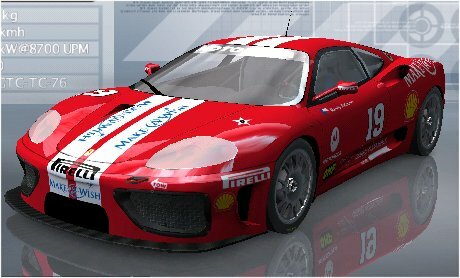 Here a Ferrari from France Team "Italia Motors"
Danke, Charly, auch für deine Worte in den anderen Threads. P.S. Ich helfe immer gerne! 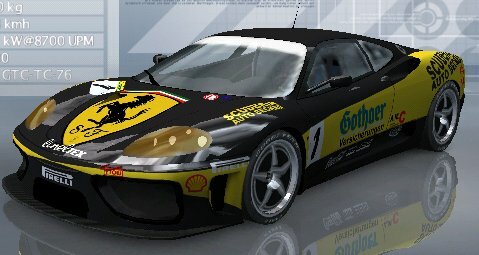 Da ich für den Ferrari auch an den Fenstern painte und dies nicht in Paint Shop geht und dies in Gimp mache, kenne ich da jetzt ein paar Tricks, falls du Hilfe brauchst, melde Dich. Ist bloß ziemlich kompliziert in Worte zu fassen, was man da so machen muß, damit es vernüftig wird.